For the first time in virtual aviation history, you as a controller are able to look at the weather. Yes, we know that you can read the METAR, but with Rotate’s Weather Radar you can see it. As it stands in virtual aviation, there is no in-client weather radar for controllers. Your pilots could be flying directly into a thunderstorm, and you wouldn’t even see it coming. The Weather Radar improves this state of affairs. 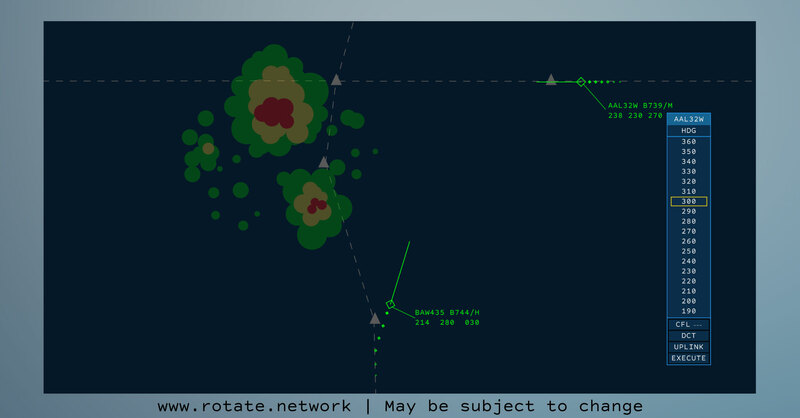 Now you will actually be able to guide pilots around bad weather. You won’t need eyewitness weather information in order to plan redirects. Instead of receiving that info second-hand, trusting the weather reports from pilots, you can take well-informed action. This new feature will help you proactively direct your pilots. You will see first-hand if you need to start planning a reroute. Rain, hail and any other precipitation and its strength will be displayed. Now you are the person with the plan, not waiting for the data you need to do your job. We want to implement this feature within the ATC Client, so that it is an integrated part of your controlling experience. It will give you yet more realism in your controlling experience and improved flight safety due to a better understanding of your pilots’ potential reroutes.